I’ve been with Mario Kart from the start. I’ve raced the Rainbow Road on the SNES, I’ve picked up the gold in the Mushroom Cup on the GameBoy Advance, I even tag-teamed my way through the curio that was Double Dash for the Gamecube. But there’s nothing quite like Mario Kart VR. As a Mario Kart veteran fan that’s seen the series evolve from its 16-bit pixel roots to the silky visuals of the Nintendo Switch version, the new Mario Kart Arcade GP VR experience is like a dream come true. If ever you’ve wondered what it’d be like to throw a green shell with your own hand, or go bumper to bumper with Wario’s wacky racer, this is your chance to really enter into the world of the Mushroom Kingdom. Situated in London’s O2 Arena at the Hollywood Bowl venue’s arcade, Mario Kart VR, as you’d imagine, isn’t your regular Mario Kart experience. For starters, it’s not developed by Nintendo. Instead, like the existing Mario Kart Arcade GP series, it’s made under license by co-developer Bandai Namco. 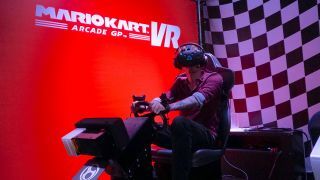 What you’ve got then is an intense, 5-or-so minute race that takes advantage of virtual reality technology to give you a feel for what it would really be like to sit in the driver’s seat during a madcap Mario Kart race. First, the kart itself. It’s pretty much standard arcade racer fare (but for a few embellishments) with brake and accelerate pedals, and a steering wheel. Things get a bit spicier with the fact that the whole kart is sat atop a hydraulics system that rocks and shakes in time with your movements on the track, and that there’s a wind machine pointed at your face, giving you a cool blast when your racer speeds off or takes to the skies. Then, onto the VR equipment. Mario Kart VR uses a HTC Vive headset – renowned for its room-tracking capabilities, but here employed for its HTC Vive Tracker accessories. The Vive goggles are strapped to your head by a dedicated VR staff member at the venue so that virtual reality newbies know what to do, and calibrated by staff too so that you sit suitably aligned in your vehicle. The trackers then slip onto the top of your hands with a rubber strap, letting your hands be followed by the HTC Vive’s motion sensors in the same way your head is. And then… you’re off! Which kart you sit in determines which character you’ll get to play as – either Mario, Luigi, Princess Peach or Yoshi. It’s the first of a few significant differences between Mario Kart VR compared to the mainline series. These are the only playable characters, with handling all-but identical across all four racers – it’s just the aesthetically different karts and virtual hands and legs that differ. Bowser and Wario join the race as CPU controlled competitors, making a villainous entrance by bashing into you on the starting grid before the race has even began. A few other omissions and differences are notable – there’s no drifting or slipstreaming, making for a simpler experience that’s friendlier to causal fans who may be joining in just for the VR thrills alone. Weapons are handled differently too. There are only banana peels, green shells and hammers available, and these (thanks to the trackers) can be literally grabbed out of the air, hanging from balloons above the track. It’s a great addition to the experience, with a physical, visceral thrill coming from the ability to literally lob a projectile at your racing rivals. Those differences aside, it’s pretty much business as usual. A single course is available (with whispers of expanded content coming in the near future), acting as a greatest hits package for series-favorite locations. You’ll cruise around Bowser’s castle, take on hairpin turns on the Royal Raceway and soar through the air with a self-deploying glider. Considering you’ve got only around 5 minutes to enjoy Mario Kart VR’s single course, it’s a wise decision, giving you a chance to take a whistlestop tour of some key locations in the Mario universe. It also gives the developers the chance to cherry pick the most VR-friendly props and settings from the series and throw them at you in quick succession – it can be surprisingly, heart-pumpingly intimidating to face down a giant piranha plant, skid underneath a falling whomp block, or go shoulder-to-shoulder with Bowser. Coming face-to-face with the King Koopa himself is quite an experience: he’s a big old bruiser in the games, but it’s hard to appreciate the sleazy reptile’s sense of scale until he’s bearing down on you at 100mph. It’s a teasingly-short race, but it’s a thrilling one. There’s a sneaking suspicion that lots of the race is tightly stage managed (different sections of the course act as portals that load in new level themes, which seem to miraculously propel Wario and Bowser to the front of the pack again), and it’d be great to see more some advanced control options (such as powerslides) added to give the action a little more strategy. But all in, it’s great fun. A session on Mario Kart Arcade GP VR costs £7.99 (around $10 / AU$15 which feels a tad expensive, despite how enjoyable it all is). While London is currently the only city outside of Japan where you can strap into the VR version of Mario Kart, the machines will soon be popping up in UK cities Leeds and Tunbridge Wells. Other locations around the globe will have to wait for the time being – but our time with Mario and friends in VR was fantastic fun, which hopefully will translate into seeing the machines popping up around the world.